Extraterrestrial intelligent life not only exists, but over a thousand UFOs are reported each month and represent technologically advanced spacecraft conducting surveillance of Earth. Nothing about this phenomenon has changed since Biblical times. Many of these sentient beings in UFO’s were once mistaken for ‘angels’, and their UFO craft were further mistaken as ‘chariots’, in our Old Testament Bible; this has not ceased but rather beings and their craft still visit us, but in ever-increasing numbers. “….his chariots of conveyance, which he sends for his friends, as he did for Elijah …his chariots of state, in the midst of which he shows his glory and power.” Psalm 91. Remember, “For we are fighting with people not made of flesh and blood, but against persons without bodies—evil rulers of the unseen world, those mighty satanic beings and great evil princes of darkness who rule this world, and against huge numbers of wicked spirits in high places. Put on all God’s armor so that you will be able to stand safe.”Ephesians 6. From what we now understand and have since learned about aliens, the Bible is one of the best books ever written about UFOs and their occupants. Mistaken for ‘angels’, alien beings in Genesis, the first book of the Old Testament Bible, the Jewish Torah, are described as having bodies with parts such as hands, feet, eyes, head, voices, mouths, hair, faces and other living being body parts. Genesis is oddly accurate in its descriptions of aliens and should be seen as a historic and scientific document rather than a religious one. ancient civilizations were more technically and scientifically oriented through interactions with these beings, than we once believed. Ancient Sumerian texts, reveal the existence of Aliens mistaken for ‘Angels’ as Anunnaki, ‘those who from Heaven to Earth Came’. Biblical people called the skies,” Heaven”. One interesting fact is that the Bible often refers to ‘Angels’ in Glowing Metal craft. The Hebrew word ‘hashmal’ refers to glowing metal in the description of the divine glory and brightness and the appearance of fire from the craft. Throughout the Bible and Torah we are told that the “Angels” were able to introduce life into old women and even very young girls, by implication, virgins. Aliens masquerading as ‘angels’ took part in ‘God’s ‘covenant’ with Abraham and Sarah his barren 90 year old wife and gave them a son, Isaac. Today we well know that births that appeared supernatural could have likely been accomplished by alien advanced technology, much as we would transfer fertilized eggs into a ovary of a woman recipient. Interestingly, John the Baptist was born after the ‘Angel’, Gabriel, appeared before Zechariah and his barren wife Elizabeth. According to the testimony of modern-day abductees similar births are commonly occurring today. Moreover, to understand the meaning of Christmas, one must take into account the blazing ‘star’ which hovered over Christ’s place of birth; such a star would move, making transit to Christ’s birthplace by the magi impossible. An alien craft instead held fast in the sky to make geonavigation possible. UFO aliens, that they called called’ angels’ are still here accomplishing miracles among us. “For he will command his angels concerning you to guard you in all your ways.”Psalms 91. His mother Mary was engaged to be married to Joseph. But while she was very young( still a virgin) she became pregnant by the ‘Holy Spirit’. Then Joseph, her fiance, a man of stern principle, decided to break the engagement and to do it quietly, as he did not want to disgrace her. As he lay awake considering this, he fell into a dream and saw an ‘angel’ standing beside him. The alien(‘angel’) said, “ Joseph son of David, don’t hesitate to take Mary as your wife! For the child within her has been conceived by the Holy Spirit. And she will have a Son and you will name him Jesus (meaning ‘Savior’) for he will save his people from their sins. When Joseph awoke, he did as the alien, (‘angel’) commanded, and brought Mary home to be his wife, but she remained a virgin until her Son was born, and Joseph named him ‘Jesus’.” (Matthew 1-18 to 25). The children of Israel followed a light, by night, a platform, cloud, by day and fed by manna, wandered forty years in the desert, the time necessary for a new generation of altered DNA, “chosen people” to come upon the scene. UFO enthusiasts want to build a memorial to “fallen aliens” who have died during their alleged Earthly encounters, news channel tells us. In August of 1945 Jose Padilla and Reme Baca said they were sent out on horseback from the Padilla Ranch in San Antonio New Mexico tasked to check on Jose’s father’s herd of new cows. What they were sent to do and what they claimed to have experienced was nothing short of what actually occurred to ancient people. With their horses tethered as they hid behind a rock in the distant reaches of the New Mexico desert – Jose 9 and Reme 7 years of age at the time – were awe-struck by the sound of thunder and the grinding thud of something strange that came to earth on the Padilla Ranch. With trepidation tendered by child-like watchfulness they approached the crash site to within 200 yards to witness a craft stuck in rock and sand; its charred 30 foot hull shrouded in dust and burned ash had skidded to rest at the end of a wide plough-like furrow the length of a football field. Using binoculars they saw strewn wreckage, strange creatures and military activity that would haunt them for days to come and – for the rest of their lives. All of this occurred two full years before Roswell. At least three creatures in the unusual oval shaped craft, had, some days later, climbed into the craft itself to retrieve pieces of the wreckage after guards had vacated the area and, how these children were told by State Police to be quiet about what they had seen. Mesa – On December 13, 2010, I saw a round and small object sometimes dimly lit seen traversing at around 1315 hours each day and path for three days straight. I have been observing this faint white and round object that seemed to just appear in the sky. The object could easily be overlooked especially with sunglasses on or if you were directly in the sun. Once your eyes has adjusted, the object can be seen and sometimes with no difficulties. The object is moving extremely slow. What seems always, the object would appear while looking almost Southwest in direction (compass bearing 244 degrees) from Power Rd. and Hwy 60, and between 30 to 45 degrees above the SW horizon at an altitude estimated to be about 3,000 feet. The object appears to be traversing West (270 degrees). And for the past two days, I was also trying to get additional pictures. Today, I managed to set my camera on the tripod, locate, and keep track of the object. I used 2 different lenses: a 300mm lens 4.5G and a 500mm lens with a 2X telo-converter (1000mm) with built-in darken lens. When I used the 1000mm, the object was about 22 to 30 degrees above the horizon. The picture shown is the 1000mm. Phoenix – A camera was set up to take time lapse, one photo every minute on December 12, 2010. When reviewing later that night I saw this image in one frame. The location is 35 Ave. and Lower Buckeye Rd. in Phoenix looking south over the Estrella Mountains. 9:50 am. I also have collected some anomalous fibers falling from the sky both in town and way out in the desert. I have examined the fibers under 20 x magnifications, ultraviolet light, and side by side with cotton and spider/cobwebs. It is some strange stuff. Moreno VALLEY – While out heading east on Romana Expressway and taking pictures of the beautiful scenery on December 4, 2010, I stopped to take pictures of some clouds. When I returned home and loaded them into my computer I noticed something strange in the picture. At first I thought it was a reflection but I noticed it had a shadow on the cloud and it looked like an octagon but when I cropped it and tried to enhance it I noticed that it was more like a cube. It seemed like the picture I took was at an angle that captured it when it was blending in with the clouds. It was reflecting the clouds and no one would have noticed it with the naked eye. This is scary because this thing was huge and just sitting there with no one even knowing it is there. I think the government need to find out what they want and are they a danger to us if they don’t already know they are there. It seems kind of strange that people take pictures of these things they can’t see with a naked eye and see it later on their camera. It’s hard to believe that the government doesn’t know the UFOs are there. Antioch – On December 7, 2010 , I saw and captured on video a small pulsating ruby red light in the night sky at 11 PM. The first time was Thanksgiving evening around 9:30 PM, and the second time was this past Tuesday evening. I was using a Konica-Minolta Dimage Z10 digital camera. I was surprised and I expected to see some sort of craft. I saw a red pulsating light of a small bodied object that seems quite elastic and is crawling around the sky on an invisible web that I call the “Cosmic Spider. I have combined the two together in a slowed down version and the length of the clip runs almost 15 minutes, but it has great detail and it’s easy to view. Note: This same witness has taken other interesting footage of strange airborne objects. The above video is a small clip of the original which I brightened to reveal more detail. Farmington – While driving south down a two lane highway, I noticed an object in the sky moving towards me on November 15, 2010, at 8:20 PM. I thought it was a passenger plane heading to Bradley Airport, but it seemed too low to be this far away. I turned left on to Route 4 keeping an eye out for the craft. I saw it coming towards me, now to my right. I pulled my truck off the road and rolled down my window sticking my head out. It passed directly over me at a constant rather slow speed – it was now on the left side of the truck. I listened hard for a sound of engines. None detected. I could make out a triangular shape, although the rear corners of the wings (or whatever) had a radius – not sharp angles. Craft was the width of my fingers held 2 – 3 inches wide at arm’s length. There were 3 rather large square white lights, or illuminations, down the bottom center of the craft. This seemed unusual to me. There were two white strobes flashing on each side of the craft. This may have been a secret military craft. It flew a constant, straight path towards the north. I do not feel it was alien in nature. It did nothing remarkable. NAPLES – On December 8, 2010, I was on the couch on my computer about to go to bed then I looked out my window when it flew overhead from my house to the next building across from me , 20 feet away, low enough to almost land on the roof; it just bolted across and then disappeared . It was a light Blue in color and very bright. I knew it was not a plane or helicopter as it had no flashing light, just a solid light blue color. Bradenton – On December 10, 2010, I was taking pictures of the sun and these star like objects nearby. I got a cluster on one shot, and very clear bright object on another. I took 30 shots around 1pm on a clear day no birds in the area. I have taken pictures of birds by the sun I know what they look like; they appear as black smudges/dots. Shots were taken every 5 seconds for up to 30 shots. Only two shots showed objects. Most of the time, the shots are clear, but once in while I find an object. These seem to be illuminating with their own light. These are not lens flare. Lens flare appears as a line across the picture. And it would not be a cluster. I continue also to record nightly with night vision scope. Still waiting to hear about the midnight flashes I sent in a while ago. PLACERVILLE – My son in law and myself were deer hunting around 11:15 am on November 27, 2010. It was a clear day with some cloud cover and about 38 degrees. There was no Deer/Elk to be found , not even a chipmunk or squirrel. I thought that was a bit odd since this area is teaming with wildlife. The whole time we were in that valley it felt as if someone was watching us. After hunting for awhile I decided to snap a few pictures with my Canon Powershot A550 7.1. I got home and downloaded the pictures and I noticed a disk in my picture. I am a retired Military man stationed on aircraft carriers and one of my “jobs” was to identify aircraft on approach during launch and recovery cycles. I have never seen anything like what was on this picture! I looked and saw a white circle-ish object moving across the sky towards Haleakala Crater going really fast with a contrail behind it. At first I thought it was a plane but it was just too weird of a shape. Then it began making a downwards movement and heading straight towards the mountain. I thought it was a missile. I watched it descend and fly right into the mountain. I was waiting for a crash or fire or something, but there was nothing. I noticed that the clouds were really weird after that. They turned a darkish color and were covering the whole mountain. 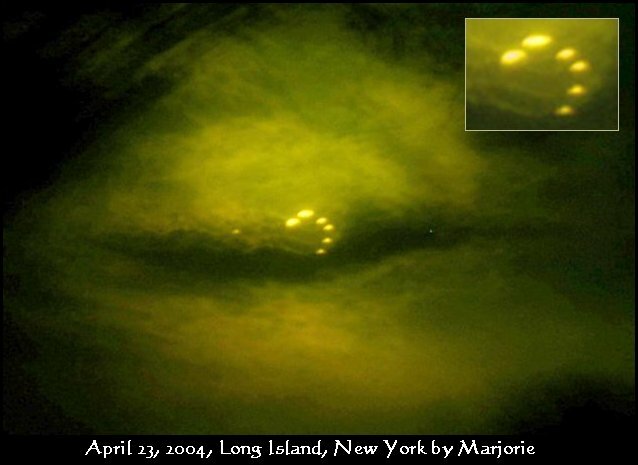 Des Plaines – My sister, my brother and I witnessed multiple lights in the sky December 5, 2010, from 5:30 to 7 PM. At first I thought they were planes, but then we noticed they would hover in the sky and change colors. We witnessed two of the objects turn into one and then the light of the object got bright. At first they were scattered. Then they synchronized into a huge oval shape. They were in the sky for about an hour. I couldn’t believe no one else was stopping to look. I counted eleven of them and it looked like they were moving west and then they would come back. We got in the car to see if I could get a better recording of the on my iPod, but as we kept driving we realized they were a lot further then they actually looked like they were. We live by O’Hare Airport and I have lived here long enough to know the difference between a plane and something that is not. Detroit — T his sighting has been driving me crazy. I was driving south on Highway 75 where there is a lot of industrial ground light and to the left I saw an X pattern coming slowly across the highway, with no lights at all. The X pattern looked like very dim ovals that were barely visible. No noise and no lights. I could not make out any other shape behind the X, except a blackish back ground that seemed to absorb the ground light. I never believed in this stuff until last night. Have you had any other sightings of this kind? Ann Arbor – I left for work from Burton on December 2, 2010, and as I was driving I kept noticing a bright object hovering in the sky for about a half hour. I called home and told my wife to go outside and look in the easterly direction and she also saw it. She took pictures with the camera and went back inside. I reached just outside of Ann Arbor and it was still visible in the parking lot at work. One noticeable thing about the object is the moonlight was pointing directly at it. It appeared it was in alignment with the Sun and Moon. It seemed too bright to be a planet or star and it was low in the sky? My wife’s pictures show a shape. Manchester – My Fianc went out on the side porch on November 28, 2010, and noticed something hovering in the south east sky. He called me out to ask what I thought. It was a silver missile shaped object with a semi-circle attachment to one end. As it was very cold outside we watched it off and on from inside the house and outside the house. It appeared to be using the rising sun to gather energy. After the first five minutes, the semi circle part started ‘pulsating’ and appeared to be morphing. I got a pair of binoculars to watch; as the semi circle thing appeared to morph off of the missile shape object. On one of the many times we went into the house to get warm when we came back out the missile shaped object disappeared. I know it wasn’t a plane or blimp, or any type of balloon. It pulsating and morphing. Glassboro “On November 28, 2010, I was outside on our deck smoking and saw a red-orange object flying in a straight line level with ground at a low altitude at about 75-80 degrees above the horizon. It was flying west very fast and I saw it for one or two seconds before it disappeared behind my neighbor’s house. The object looked like a fire log with no flames, just glowing red hot. I thought it was a meteor at first, but just didn’t look like one after I thought about it. NEW BRUNSWICK – I was exiting off of Route 18 North on December 2, 2010, and began to merge onto Route 1 South, at 8 PM , and noticed a low-altitude object with three bright white lights over the highway. I thought at first it was a plane, but I noticed there were no red, green, or flashing navigation lights visible. I was trying to get a better visual while driving but this object was large enough and flying low so I was able to get a good look at it going 50 mph down the highway. It was triangular in shape with three bright white lights on each corner. The edges of the craft were illuminated slightly and there was also a red light toward the center of the craft that was also steady and not blinking. The object was headed in a northerly direction right over Route 1 as I was headed south. The sheer size of the craft was immense and I was reluctant to post this sighting until I did some research on large military cargo planes like the Galaxy and Globe master. However, I do not believe that the object was any of these planes. Secondly, I do not believe a military cargo plane would be devoid of proper navigation lights and flying at such a low altitude. The above image is a rendering. This case is under investigation by Jack Nicholias. EVANS MILLS – I was driving home from work on December 9, 2010, and looked over and had seen this fire ball looking thing with looked like two tails coming off of it. I then called my wife and told her to go outside and start recording it then I pulled up to the house a minute later then took over recording it on her Samsung Galaxy phone. I couldn’t get the phone to zoom in at the time and then the object started going down behind some clouds. I have seen this type of object all over the internet and this is my second time seeing it in person the first time was down in Louisiana a month ago before seeing this object. The wife also told me she heard a sonic boom right before I called her and the dogs were barking loudly. I have a little more footage on my Sony Camcorder. Averill Park – An all black flying saucer shaped object was seen moving low to the ground going slow it then sped up and it was gone on November 20, 2010 at 5 PM.. It had about eight lights around it red, green and yellow lights and it turned as it moved through the sky. Massillon – A t riangular-shaped object was flying low with white flashing lights over Perry Township on November 19, 2010 at 8:04 PM. As I was driving north on Genoa Avenue, I saw something that was not an airplane or a blimp, or anything I’d ever seen before. It had two red lights on the edge of the wings, with white lights in the middle. The craft was heading south as I drove north. It was flying slow and very low, maybe 100 feet above the trees. As I drove closer to it, I could see flashing multiple white lights underneath it. I had my window down, and I noticed there was no noise at all. I tried taking a photo with my phone, but it didn’t turn out. 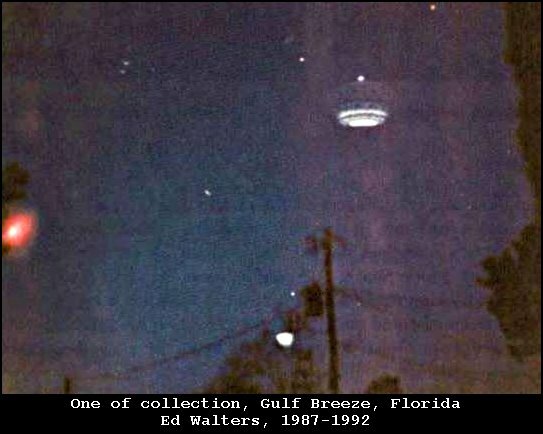 SweetWater – As I was facing the town of Sweetwater we saw a very bright craft that was silently flying a low across the sky. The craft then slowed down long enough for me to point out the bright object then sped up and vanished. It also had no sound. I was not able to identify the shape of the object. Brownwood – The wife and I had driven to San Angelo from Brownwood that day to find some good food and was a mile west of Santa Ana on our way home and I observed a low flying object. At first, I thought it was a really low plane, but there’s no airport nearby, and it made no sounds. The object flew just a hundred feet up hovering and turning clockwise. I could see its round shape and three very bright white lights, but none were blinking. At first I thought it was a plane turning, but the lights kept rotating around the object, two lights showed and then three. One would rotate out of view and another would appear from the other side. It made about ten revolutions and disappeared completely. My wife said, “ Did you just see that?” And I said, “ Yes, I did, but kept silent from the awe.” We slowed and looked around. The only other traffic was an 18-wheeler behind us and he slowed too and seemed to be looking! We pulled over to let him pass and he waved and pointed up, so we knew he had seen it too! HOUSTON – On November 25, 2010, I was out in the garden looking for chemtrails and I noticed a shimmery flash, glow in the sky. I couldn’t exactly make out what it was so I took the picture with my phone. When I transferred it to my lap-top that is when I saw the UFO. Incidentally, the day before this event I was back in the garden again when I did see a strange, unidentifiable object hovering very slowly across the roof of my house. I believe it was the same UFO that I caught the picture of. I have seen and photographed many strange things and UFO’s. I live near Stonehenge, and I think that’s the connection. If you have a field office out here I would love to contact them to show them some of my photos. 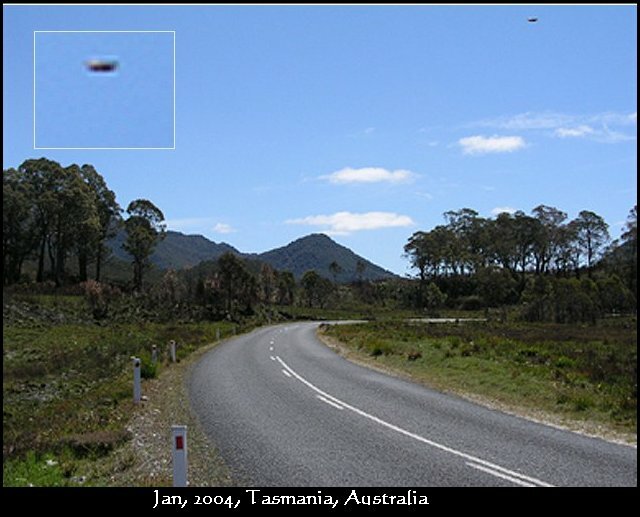 Adelaide – This unidentified flying object was filmed on December 07, 2010, and shown on UTube. 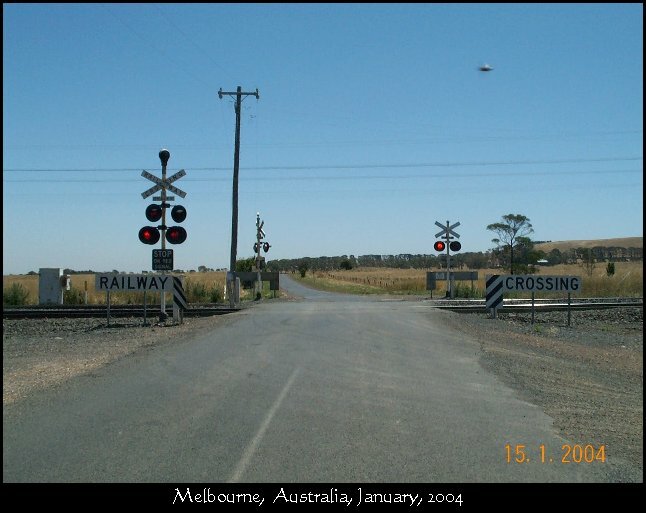 ELIZABETH GROVE – I was driving south past Elizabeth Grove along Main North Road on November 17, 2010, when my son and I saw an unusual object about five kilometres out to the west at about 30 degrees up from the horizon either moving very slowly or motionless. The object seemed to be of a flattish square shape, hovering in a horizontal position. I estimate its size was about 10-15 meters squared. The underside was a whitish colour with dark geometrical lines, hard to tell but there could have been dark features on either its top or edge. It seemed to be quite a solid object as it looked very stable considering there was quite a bit of wind. 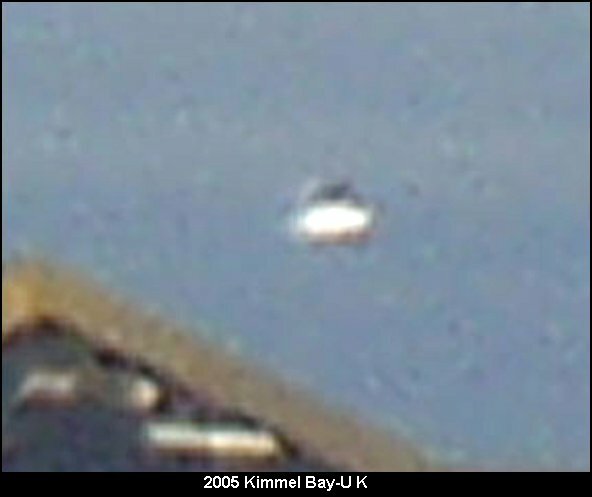 SAO PAULO – This cylinder shaped UFO was filmed in May of 2010, at 4:30 PM. The complete video may be seen on UTube. I noticed the clouds southwest were very colorful of rainbow colors. At exactly 4:12 pm, I took two pictures of these colorful clouds. The next day, I reviewed the pictures. I found one quite fascinating revealing an unknown dark oval object NOT seen with the naked eye. My good friend Chris enhanced the object to better illustrate photographic description. There also appears to be a white aura surrounding this thing. PALERMO – On 23 November 2010, around 12 PM, we stopped on the highway to get fuel, and I shot some photos of the mountain. I took four photos, one after another, within one minute, then two or three photos more. I didn’t see anything strange moving in the sky before, during or after I took the photos. Two days later, I downloaded the photos, and saw this fourth photo that there is something, like a spot on the image so I zoomed in and I was shocked to find that it looks like a cap, with two lights on it. I increased the contrast at maximum and decreased at a minimum the mid-tones and the result was really surprising. I am sending you the original photo plus the first before and the first after. 52.132633 N 5.291266 E – On December 12, 2010, I saw a triangle flying towards me that was close and silent. It had three red lights at each end, and two airplane strobe like lights on its side. It flew above my house and I could clearly see it was a black triangle. Perfectly black, it was beautiful! It slowly flew back towards the direction it came from and I could follow it with my eyes for twenty minutes with no noise. It was very slow and flying just under the clouds. I saw it nine times coming from different directions. I called my brother and he saw it also and was amazed by how silent and slow it flew. It was like it was doing a grid search. There was a cigar like objects filled with seven horizontal bright lights that I observed from 10 PM till 04:30 AM. I have never ever seen so many ufo’s ever in one night. Stonehenge – On December 4, 2010, I was out in garden sky-watching that is my favorite hobby and noticed a shining flash, glow in the sky. I couldn’t exactly make out what it was so I took the picture with my phone. When I transfer it to my lap-top that is when I saw the UFO. Incidentally, the day before this event I was back in the garden again when I did see a strange, unidentifiable object hovering very slowly across the roof of my house. When I think about this I believe it was the same UFO that I caught the picture of. I have seen and photographed many strange simulacra’s and UFO’s. I live near Stonehenge; I think that’s the connection. Now, that you have seen some recent evidences, clear and irrefutable photographic proofs of nonhuman beings piloting highly technological craft, in the skies above many countries, seriously reconsider and rethink the experiences that Abraham and Moses and Ezekiel had . ‘chariots’ flown by ‘angels’, is precisely what you would have recorded seeing. and most recently we scramble to deduce ‘smart skins’ of craft which like chameleons, alter shape and color according to environments. He, in reptilian form and in grey form instead sees us in much the same perfunctory way, that we see chickens and perpertrated a hoax in ancient times, masquerading as God. The result was the writing and compilation of the Old Testament Bible.